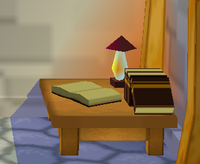 Luigi's Diary is an item in Paper Mario. This diary of Luigi's can be accessed after Mario gets the Ground Pound in Chapter Three. It is possible for Mario to get in there from Mario and Luigi's room by ground pounding the floor. After every chapter there will be a new entry in the diary, that can be quite humorous to read. Before Chapter Three Mario can't access Luigi's Diary, but he can tell that Luigi is writing in it, because there will be music notes coming out of the brothers' room's floor. However, during the events of Chapter 3 when Mario obtains the Ground Pound, if the player goes all the way back from the Boo's Mansion to Toad Town and decides to enter the basement at this point before having finished Chapter 3, Luigi will still be in there and he will be stunned for a brief moment. He will flee and leave his diary behind. Luigi's Diary also makes small references to spinoff games from the Mario franchise, which includes Mario Golf, Mario Tennis, and Mario Party, and even a note of Luigi possibly getting his own game, which later on became Luigi's Mansion. Page 1: Once again, my brother went on an exciting journey. Once again, he went alone. It's so unfair! I remember the carefree days when we played Golf and Tennis and had Parties. I remodeled the house and made a secret basement my brother has no idea! It's the perfect place to write in you, my secret diary. Page 2: I heard that a ghost appeared in Toad Town today. It was big, really big. And it had red eyes, a giant, gaping mouth and a mustache. .......... Because you're my secret diary, I'll tell you the truth: Yaaaah! I hate ghosts!! What will I do if it appears at night! Come back, Mario! I'm scared! Yikes! I can feel something behind me. Ahhh! I'm sure it's there, but I can't look back! No! No! Get away! I think I'll be safe if I don't freeze with fear. I'll just shut my eyes and take five steps back, and then I'll jump and dash into bed. Here I go! Page 3: A Shy Guy appeared at my house the other day. I found it asleep in my bed! Can you believe it? I ran after him, but he was way too fast for me. I heard that a lot of Shy Guys also appeared in Toad Town. Supposedly, they came from Shy Guy's Toy Box. It must be somewhere in town. A Toy Box... I wouldn't mind seeing that. Maybe they have a Nintendo 64! Page 4: The whole Goomba family visited me today. They said that Goombario is in the care of my brother, then they gave me a souvenir! It was a Goomnut, a special treat from Goomba Village. It looked so yummy I ate it without telling my brother! My FP increased by 3. .........You think he'll notice? Page 5: I heard that my brother went to Lavalava Island on a tuna. Unbelievable! So unfair!! I... I... I wanna ride on a tuna, too! Page 6: I heard that some Yoshi kids on Lavalava Island got lost and my brother saved them. I bet Yoshi kids are just about the cutest things around. I'm a bit jealous of my brother. Page 9: Somebody said to me that a way will open when you use a scarf and a bucket... What? A scarf for a snowman? Wouldn't it melt him? Page 10: Yesterday, I got stuck in the trapdoor when I was entering my secret room... Have I been using it too much? Or am I putting on weight? I'd better oil it to make it open easier. Page 12: I heard that my brother finally saved Princess Peach! Bowser increased his power with the Star Rod but my brilliant brother beat him anyway! I guess he'll be coming back home pretty soon. I'm looking forward to listening to the story of his adventure. Anyway, I'm going to finish this diary for now. I have to seal this room off before he notices that I remodeled without telling him. Now I'm going to prepare a dinner to celebrate Mario's return! This page was last edited on April 20, 2019, at 12:23.